In August 1914 the nations of Europe stumbled into a four-year conflict that killed over 16 million people. 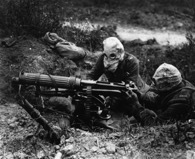 In one battle alone, the Battle of the Somme, over one million soldiers died, and the combatants of that battle might have been hard-pressed to explain what they were trying to achieve. World War I can be seen as even more disastrous considering the decades of relative peace and prosperity that preceded it. 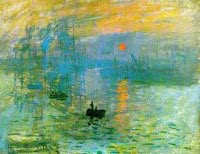 (I stress the word “relative.”) For Europe, the late nineteenth century was a time of tranquility and economic growth that fostered much scientific and artistic innovation (think Darwin and Monet). Then came World War I, the war that achieved little beyond causing a second world war and the deaths of another 60 million people. They called World War I the “war to end war.” Marching morons, indeed. Countless works of art, including many films and literary works, have attempted to describe the insanity and destructiveness of World War I. A piece of orchestral music that many put into that category is Maurice Ravel’s La Valse, a piece composed in 1919 that some hear as a tone poem depicting European civilization descending into barbarism. Ravel denied this interpretation and stated, "This dance may seem tragic, like any other emotion pushed to the extreme. But one should only see in it what the music expresses: an ascending progression of sonority, to which the stage comes along to add light and movement." Ravel completed La Valse shortly after World War I, and it's easy to see how some might have heard the brutality of the war in Ravel's "ascending progression of sonority." In composing music that clearly portrays the decay and destruction of the Viennese waltz, Ravel created what many can't help but hear as a metaphor for what happened in Europe from 1850 to 1918. Follow the time indicators listed below and listen to how the elegant Viennese waltz heard at the beginning of La Valse moves through several episodes before deteriorating into confusion and despair. After listening to the orchestral version, don't forget to listen to the encore embedded at the end — a terrific version of La Valse for solo piano by Steven Osborne. The music begins with a rumbling in the basses as an elegant Viennese waltz slowly emerges from the fog. A variety of instruments playing fragments of the Viennese waltz. Each fragment is played with unexpected modulations and instrumentation. The waltz begins to whirl out of control. The waltz dies as the music changes from three beats per measure (waltz time) to two beats per measure (march time). As an encore, here's a version of La Valse for solo piano.